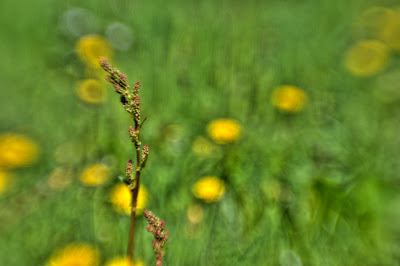 The two thing I've been playing with recently are the Lensbaby an High Dynamic Range (HDR) so I thought, why not both? All the images on this post were taken while on a short walk from my house so there's nothing much to say about them. 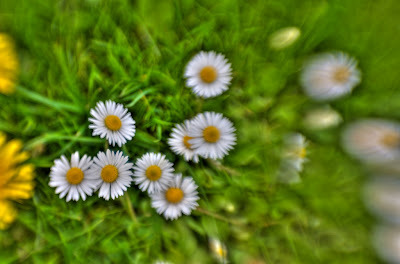 So maybe a bit more information about the Lensbaby. 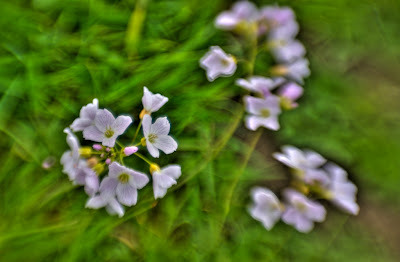 The Lensbaby is a range of very basic 50mm lens which have selective focus area which can be moved about the image. There is no electronic connection between the camera and lens so the focusing is manual and the aperture is changed by using magnetic discs with different size holes in them. With no disc the aperture is around f2 which makes it a very fast lens with quite a wide aperture, and the 7 discs supplied with the lens go right up to f22. As with all lenses the aperture controls the depth of field with the wider aperture having the shallower depth of field but it also affects the area of the image which can be in focus with the wider aperture giving a smaller area of focus. 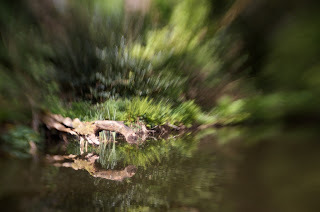 The out of focus area of the image is very different to a normal lens and is very distorted towards the edges. Points of light in the out of focus area take on the shape of the aperture hole and creative aperture kits have heart shapes, stars and blanks which can be cut to any shape you like to give some really wierd effects. 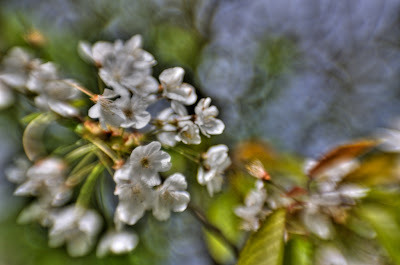 The earlier versions of the Lensbaby used a springy bellows part between the front and back which had to be manually moved into place while taking the photo. Squeezing the bellows backwards and forwards adjusted the focus and moving side to side and up or down adjusted where the focus falls in the image. 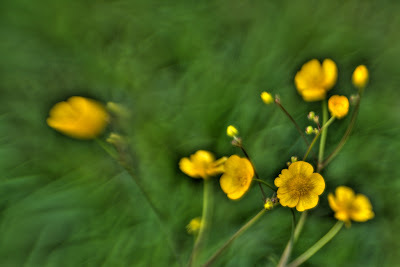 I never used one of these but I can imagine it took a lot of skill and patience to get anything in focus. The next versions had sticks at along the bellows which could be used the fix the lens in position once it had been set and also fine adjustments could be applied by twisting the sticks. The latest version uses a ball and socket arangement which enables the focus position to be set quite easily and then a focus ring to adjust the focus as in a normal manual focus lens. 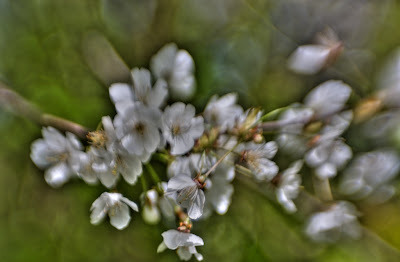 I've spent a lot of time playing with my Lensbaby Composer to try and get to a point where I'm getting the results I am wanting. My main problem is getting used to manual focusing, especially with the lens being intentionally making most of the image well out of sharp focus. I'm getting better results by not wearing my glasses but I have to make sure that I adjust the diopter on the camera eyepiece to compensate for my poor eyesight. I'm not putting any of my testing into my gallery site at the moment so here's a few from this weekend to have a look at. This first one is at a little fishing pond at the bottom of the road where I live. The focus point isn't quite right because it was supposed to be on the fallen down tree but has ended up being best on it's reflection in the water. 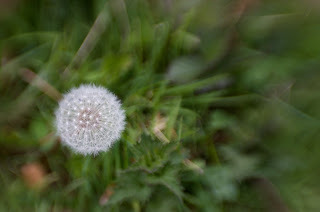 I'm much happier with the focus point on this image of the dandelion clock which I think is just about spot on. My problem with this image is is that maybe the background is a bit too busy and I'm feeling the nettle leaves are pulling my attention away from the dandelion a little. I love the daisies. Again it's a bit busy in the background but I think it works a bit better on this image because there are multiple main subjects. 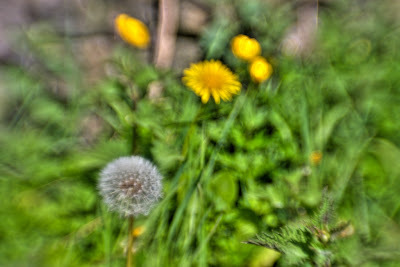 Maybe I should crop the dandelions off from the left of the image so it's just daisies. 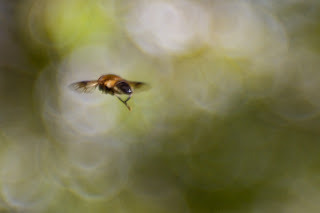 I was taking pictures of some blossom on a tree when this hover fly started buzzing me. I managed to get a few shots of it before it flew off and this was the best. The background is the white blossom and the leaves of the tree I was trying to shoot and I think it creates a good contrast to the fly. 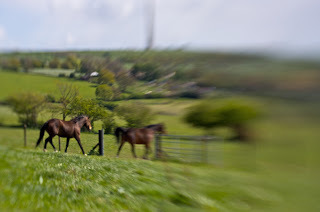 I went for a it of a walk while my daughter was having a horse riding lesson and caught this image of a couple of horses running down the field. In the background is Emley Moor television mast. This morning I took quite a lot of shots in my back garden because it was dull, wet and overcast and I didn't feel like going anywhere else. This first one is a plant that I have no idea what it is but it comes up every year and has a few small tulip shaped flowers. 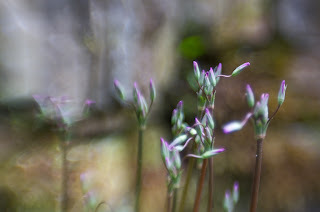 This year it looks to be producing a lot more flowers than normal and they're just about to bloom. I'll probably take some more photos of them later. 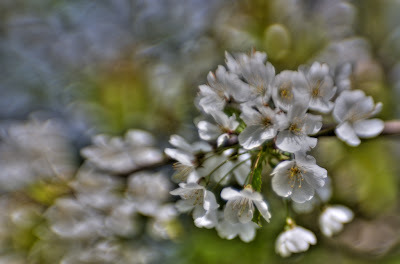 A few weeks back I sent for a free wide angle/macro conversion lens for my Lensbaby so I thought I'd put the macro bit through it's paces. 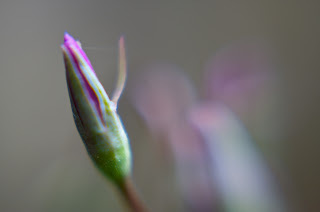 This first shot is one of the buds from the unidentified plant in the previous image. With the macro attachment the depth of field is extremely small, probably less than a millimetre so getting anything in focus is a bit of a bonus. 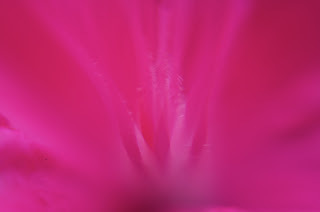 These next two images were both from the same burst of multiple shots where I was moving the camera to get different parts of this rhododendron flower somewhere near focus. 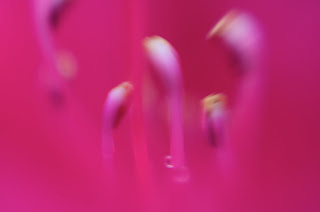 I think in this image that the nearest thing to being in focus is the little droplet of rain on the stamen. There were quite a few in between shots but I like this one because I can see details of the little hairs near the base of the stamen and if I look very closely there are some more rain droplets almost visible. I love the colour of this image and how the subtle changes in shade and brightness reveal the subject. Almost artistic. Last one. 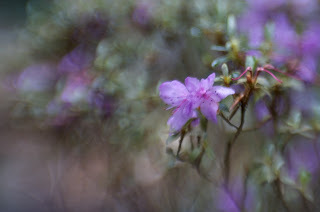 I've taken the macro converter back off to take this image of the little azalea flowers although I did take some macro shots of this flower as well but they didn't grab me as much as the rhododendron ones. In thi image I like the background on the left because it's very dreamy. Unfortunately the old flower heads to the right of the flowers are too much in focus and are quite distracting. I'll keep on testing the lens and post more images later. I've also been doing a lot more HDR images and I'll post some later in the week when I've sorted out some of the more interesting ones.